We left for the Great Ocean Road after a 4 night stay and returned after our road trip because we were really satisfied with our earlier stay. Needless to day, the second stay didn't disappoint at all. Two thumbs up for Alto! It was a perfect stay on our first visit to Melbourne. 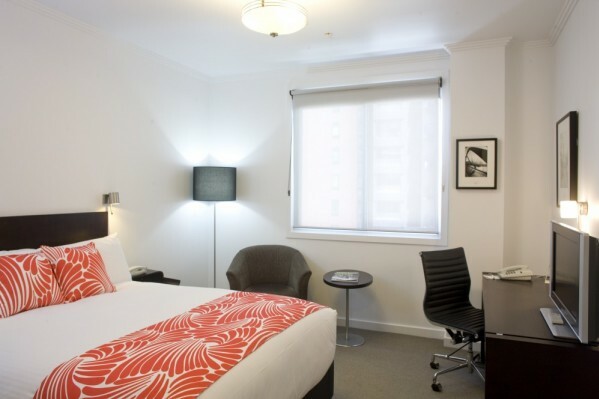 The hotel is centrally located right across from Southern Cross Station which makes transportation and accessibility a breeze. The room was cleaned properly every single day, and the bed was firm and good - perfect for a great night of sleep and rest. We will certainly recommend to family and friends, and will be rebooking if we were to visit Melbourne again. Another great stay at the Alto, thanks guys. The room was adequate, but the staff were fantastic. We had a wonderful stay. Found it to be a great starting location for everywhere we wanted to go. The staff were all so lovely. We felt very welcomed. We thoroughly enjoyed our stay at the Alto. The rooms were clean, beds very comfortable and the children appreciated the free wi-fi. Comfort room was reat after long plane3 trip and early arrival. Excellent suggestions for dining and activities. What was the name and contact info on the companty selling the matresses for the beds? Bed orders for the same specification can be made via the hotel with delivery to anywhere in Australia including the very important deep pillow topper. Their retail brand is King Koil however the range of beds may differ to design of the commercial beds used at Alto Hotel. Try http://www.kingkoil.com/ for products available in the USA. The receiption staff were very friendly and helpful. The room was well serviced. This was our second time with you, and certainly will make it a third if we come to Melbourne again. We are very happy with our stay. Perfect location, perfect size. Some smell from the kitchen found its way into our room in the morning and some noise from the alley at night and one early morning, but otherwise perfect! Friendly staff, gluten free bread available for breakfast are other plus. A very nice hotel. Very comfortable beds. I had a very pleasant stay. The hotel is well located and reasonably priced. I really appreciated free access to Foxtel and Wifi. The room was comfortable and efficiently serviced. Location and free WiFi access were factors in my choosing the hotel. I think both chefs produce excellent meals. The woman who cleaned my room is lovely. She left me two little easter eggs. It doesn't seem much but I appreciated the gesture - so nice. The reception staff were very helpful too. And the dinning room staff are efficient and nice. Requested a quiet room & enjoyed a VERY quiet, almost spotless room, prompt service & many Easter Eggs and apples. Good On You all - well done!! Many THANKS...........Greg & Rachel. All the comforts in a smaller but uncompromising hotel in terms of quality. Very comfortable and relaxing. Breakfast staff were very attentive and warm. Almost perfect for us EXCEPT the double bed in 409 which, unlike most beds, had a "hill" in the centre (so that you felt you needed velcro pyjamas to stay in bed) and was also much too "bouncy" for comfort. Beds are fitted with 6cm feather topper. It appears that the topper may have bunched in the middle. Our reception is open 24 hours for any concerns. Once known we would attend to these issues as soon as possible. Great location as a base to access the CBD with airport bus, train and tram so close. We have enjoyed our stay at Alto Hotel. Thanks to all the staffs for your friendliness and thoughtfulness. Will recommend Alto to people we know! The Alto is top of my list for places to stay in Melbourne. The friendliness and warmth of the staff along with the extra touches provided i.e. free wifi, bowls of fresh apples, the library and access to the coffee machine make this intimate hotel feel like a home away from home. I have, and will continue to recommend The Alto to friends and acquaintances. Alto Hotel was one of the best hotels I've stayed! I will definitely be booking Alto Hotel again the next time I come to Melbourne, it had everything I needed. A great night's sleep, perfect location, accessible to everything and the Staff were just extremely friendly! The 2 floor apartment made everything seem spacious. Amazing experience! A great 2nd stay - will be back! We were very pleased with all aspects of our stay. An ideal location with the station and tram stop so close. Loved being able to open the window but quiet at night with the double glazing. Breakfasts were lovely. Staff approachable and helpful. Really loved Melbourne. Alto was in a great location & we'd be happy to recommend and stay at Alto in the future. Had breakfast in the hotel one morning - was underwhelming for the price, but that is really all we can fault. The front desk staff were all friendly and helpful but the housekeeping staff were the standout personalities - always super friendly, smiling and courteous. Thanks for a great stay! very good hotel, clean, staff friendly. just the refrigerator in the room was too noisy. The staff were very accommodating and put me in a room very near my friends. Everyone was so friendly and nothing was too much trouble. We were very pleased with everything at Alto, For us it had a perfect location. We did miss out on dining in. Would like to stay longer next time. Had a wonderful stay great night sleep every night.Lovely and quiet. My stay at the hotel was fantastic. It was well positioned close to Southern Cross station, the convention centre and restaurants. Cleanliness was perfect which is important to me. The breakfast was good and a nice idea with the buffet and to order after that. I ate dinner in the hotel twice and it was superb, fantastic chef! The bed was very comfortable and the double glazing helps in a busy city. I really felt that every last details was thought through very carefully.